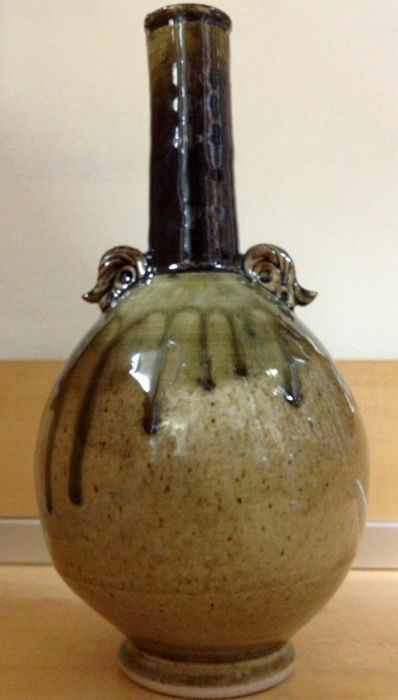 Jim Halvorson is a member of the Local Clay Artists Guild and lives in Bloomington, IN. Jim said he specialized in the craft of ceramics because he liked the "immediacy" of the materials and clay used in this line of work compared to other art media. He can create two or three dozen pieces for a single collection from one ball of clay. He then fires them in a gas kiln with a capacity of 200 pieces and after the pottery cools, individually glazes each ceramic piece. 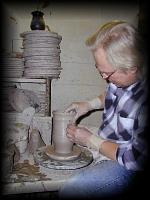 Not only is Halvorson a potter, but he is a former art instructor at Arsenal Technical High School in Indianapolis. He said he gives encouragement to his young and impressionable students, many of whom are from lower income families. "I tell them that art is something they could learn to do as a career or as a hobby -- that they can use it to express personal individuality," Halvorson said.